The South Dakota Rental Application is a document that is made available from an owner/landlord/management company to a possible client, that the client would complete for the purpose possible rental of an available rental. The potential tenant would then provide all of their information and return it to the landlord for review. The landlord/agent would proceed to verify all of the the information to ensure that the potential tenant would be a reliable client for the landlord/agent’s available rental. This document will provide all of the information necessary to be certain that the landlord/agent would be able to easily verify all of the information provided with ease. Have any of the occupants ever been convicted of a felony misdemeanor? If Yes Kind, weight, breed, age? 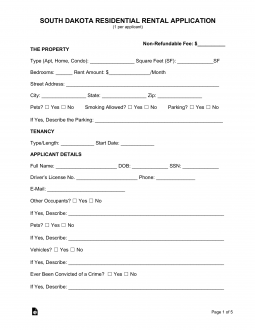 Have you or anyone listed on this application ever been evicted or sued for non-payment of rent or damage to rental property?